Soil vapor extraction (SVE) is a common and typically effective physical treatment process for remediation of volatile contaminants in vadose zone (unsaturated) soils. During SVE, contaminated soil gas is extracted from the vadose zone, treated, and then discharged to the atmosphere. SVE is most effective at sites where airflow can be induced through contaminated zones. SVE is a mature technology and has been applied in multiple configurations. Like other extraction-based technologies, SVE effectiveness typically diminishes over time as readily extracted contaminant mass is removed and mass transfer limitations begin to control the recovery of remaining contaminant mass. SVE (also referred to as in situ soil venting or vacuum extraction) is a vadose zone remediation method for volatile contaminants. SVE is based on mass transfer of contaminant from the solid (sorbed) and liquid (aqueous or non-aqueous) phases into the gas phase, followed by collection and extraction of the contaminated soil gas. Extracted contaminant mass in the gas phase (and any condensed liquid phase) is then treated in aboveground systems. SVE is most effective for contaminants with higher [[wikipedia: Henry's law | Henry's Law] constants, including a range of chlorinated solvents and hydrocarbons. SVE is a well-demonstrated, mature remediation technology that has been identified by the U.S. Environmental Protection Agency (EPA) as a presumptive remedy. SVE remediation technology uses vacuum blowers and vapor extraction wells to induce gas flow through the subsurface, collecting contaminated soil vapor, which is subsequently treated aboveground (Fig. 1). The system can be implemented with standard wells and off-the-shelf equipment (blowers, instrumentation, vapor treatment, etc.). The vacuum extraction of soil gas induces gas flow through the vadose zone, increasing the rate of mass transfer from aqueous (soil moisture), non-aqueous (pure phase), and solid (soil) phases into the gas phase. Some systems only use soil gas extraction wells. Other systems also include air injection wells to help guide airflow through contaminated zones. Enhancements for improving SVE effectiveness can include directional drilling (to access under surface features that prevent vertical drilling or to align better with the contaminant distribution and/or subsurface features), pneumatic and hydraulic fracturing (to enhance subsurface airflow), and thermal enhancement (e.g., hot air or steam injection to increase contaminant volatility). Passive SVE systems that rely on barometric pumping for soil gas extraction may also be employed. Figure 1. 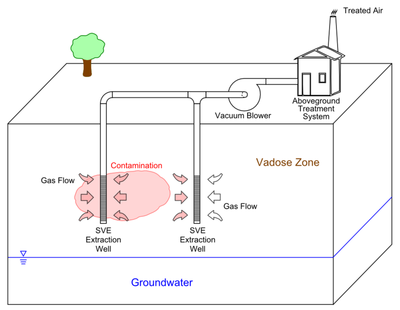 Conceptual diagram of basic SVE system for vadose zone remediation. The most commonly applied aboveground treatment technologies are thermal oxidation and granular activated carbon adsorption. Selection of a particular aboveground treatment technology depends on the contaminant, concentrations in the extracted gas, throughput, and economic considerations. The rate and extent of mass removal by SVE depends on a number of factors that influence contaminant mass transfer into the gas phase. SVE effectiveness is a function of the contaminant properties (e.g., Henry's Law constant, vapor pressure, boiling point, adsorption coefficient), temperature in the subsurface, vadose zone soil properties (e.g., soil grain size, soil moisture content, permeability, carbon content), subsurface heterogeneity, and the airflow driving force (applied pressure gradient). As an example, a highly volatile contaminant (such as trichloroethene) in a homogeneous sand with high permeability and low carbon content (i.e., low/negligible adsorption) will be readily treated with SVE. In contrast, a low vapor pressure contaminant like naphthalene would require a longer treatment time and/or SVE enhancements, especially if it were present in a heterogeneous vadose zone with one or more low-permeability layers. SVE effectiveness is also related to the ability to induce airflow through contaminated portions of the vadose zone. Airflow in porous media is affected by the amount of connected gas-filled porosity, which is a function of the total porosity and the moisture content. Because low permeability zones typically have higher water saturation, gas-filled porosity can be low and airflow is inhibited in those zones. The SVE mass removal rate can decline over time (e.g., observed as tailing on a mass removal curve) when contaminants are present in zones with lower airflow (i.e., low-permeability zones or zones of high moisture content) and/or lower volatility (or higher adsorption). Recent work has investigated layering and low permeability zones in the subsurface to understand how they affect SVE operations. Implementation of SVE involves the following elements: system design, operation, optimization, performance assessment, and closure. Several guidance documents provide information on these implementation aspects. EPA and U.S. Army Corps of Engineers (USACE) guidance documents establish an overall framework for design, operation, optimization, and closure of a SVE system. The Air Force Center for Engineering and the Environment (AFCEE) guidance presents actions and considerations for SVE system optimization, but has limited information related to approaches for SVE closure and meeting remediation goals. As time goes on, it is typical for a SVE system to exhibit a diminishing rate of contaminant extraction due to mass transfer limitations for removal of contaminant mass. Performance assessment is a key aspect to provide input for decisions about whether the system should be optimized, terminated, or transitioned to another technology to replace or augment SVE. Guidance from the Pacific Northwest National Laboratory (PNNL) supplements the aforementioned documents by discussing specific actions and decisions related to SVE optimization, transition, and/or closure. Assessment of rebound and mass flux provide approaches to evaluate system performance and obtain information on which to base decisions. ^ Pedersen, T.A., Curtis, J.T., 1991. Soil vapor extraction technology. Noyes Data Corporation, Park Ridge, New Jersey.